San Diego’s Embarcadero region is a fabulous place to explore the waterfront and take in the scenery. As you walk along the waterfront, you’ll see sailboats, warships, cruise ships, historic tall ships, ferries and more floating on the blue waters of San Diego Bay or moored at their piers. while the skyscrapers of San Diego soar overhead. Walking along the Embarcadero delivers a feast for the eyes. Not only is the Embarcadero scenic, it offers plenty of ways to spend the day. You could spend an entire day on the USS Midway alone. The USS Midway opened as a museum in San Diego in 2004. Admission to the Midway leads you on a self-guided audio tour of this aircraft carrier. You get access to most parts of this massive ship including the mess hall, quarters, berths, forecastle, engineering, bridge and flight deck. Many of the aircraft located on the flight deck are open for exploring as well. Over 40 exhibits throughout the USS Midway teach its history. Many of the docents served on the Midway and bring the history to life. The view from the flight deck of the USS Midway is awe-inspiring. You’re hundreds of feet above the water and the entire bay is spread out before you. Another fine way to experience the Embarcadero is to visit the San Diego Maritime Museum. Seven historic ships, the Star of India, the Berkeley, the Californian, Medea, Pilot, H.M.S. Surprise and B-39 Submarine make up the list of ships of the Maritime Museum. For a small fee, you can explore the ships to your heart’s content. Imagine the Star of India under full sail as you stand beneath her masts. 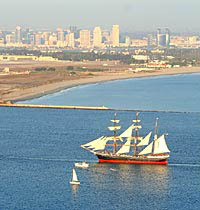 Or plan your visit to the Embarcadero during the one time a year when she is actually sailing in San Diego Bay. Urban Trees line the walk way along the water’s edge. These trees are part of a juried art competition that included over 30 entries consisting of 12-foot high poles mounted onto square planters. Each pole has been delightfully transformed into a whimsical “tree”. Every few years, a new Urban Trees competition comes to San Diego’s Embarcadero. Seaport Village is a bustling spot for entertainment along the Embarcadero. Shops, restaurants, and more beckon locals and tourists alike. Here you’ll often find free entertainment during the summer and views of San Diego Bay that can’t be beat. San Diego’s stunning Coronado Bay Bridge can be seen from the Embarcadero. If time permits, you can take a ferry from the Broadway Pier across the bay to the island of Coronado. This is a fantastic way to see the San Diego skyline. The Embarcadero Marina Park South is an outdoor venue often used for concerts and symphonies. This park is located behind the Convention Center and is easily accessible from the Trolley. The Embarcadero Marina Park North is a popular spot for picnicking and kite flying. Nothing beats being right on the waterfront, visiting the Embarcadero is one of the best ways to see San Diego in all her glory.